Babblings of a Mommy: 2 Ways To Wear An Oxford Shirt In The Spring/Summer. 2 Ways To Wear An Oxford Shirt In The Spring/Summer. I think just about everyone has an oxford shirt in their closet, right? They're practical, but a bit on the boring side. Typically worn for work or a conservative setting and not necessarily what you would think of as being fashionable. Well, here are 2 ways to dust off that ol' oxford shirt, and put a little life into it this summer! Cute outfits!! 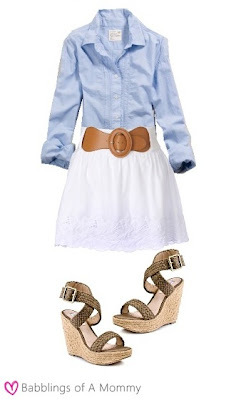 I love how you paired it with the white skirt and brown belt.